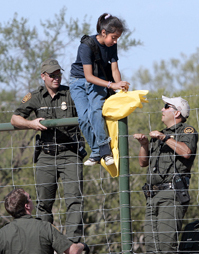 Can politicians find a way to curb illegal immigration? The number of illegal immigrants in the country has topped 12 million, making immigration once again a central topic of debate. Moreover, with undocumented workers spreading far beyond traditional "gatekeeper" states such as California and Texas, complaints about illegal immigrants have become a daily staple of talk radio. Enacting tougher enforcement policies has become a dominant theme in the 2008 presidential campaign, particularly on the Republican side. Just in the past year, states and localities have passed hundreds of bills to crack down on employers and illegal immigrants seeking public benefits. But Congress has been unable to act, despite a bipartisan deal brokered last year by the Bush administration. A new administration and the next Congress will likely face what has proved so far an impossible task — curbing the number of immigrants without causing labor shortages in key economic sectors such as agriculture and hospitality. ©2019, CQ Press, An Imprint of SAGE Publishing. All Rights Reserved. CQ Press is a registered trademark of Congressional Quarterly Inc.
Take our survey to help us improve CQ Researcher!